I’ve said it before and I’ll say it again, I frequently concentrate so much on the process of photography that I don’t actually notice what it is I’m photographing. Maybe one day, it will become second nature enough for that to change but for now it certainly remains true. There we were, pedalling slowly through the marsh heading for La Village sur la Sèvre, when a dragonfly flew aggressively after another, defending its territory. It returned and perched obligingly on its favourite sunny fence post. There are a few exceptions to my general “don’t really notice what I’m looking at” syndrome and one of those is when I’m looking at a particularly tatty specimen with only three wings instead of the usual four. 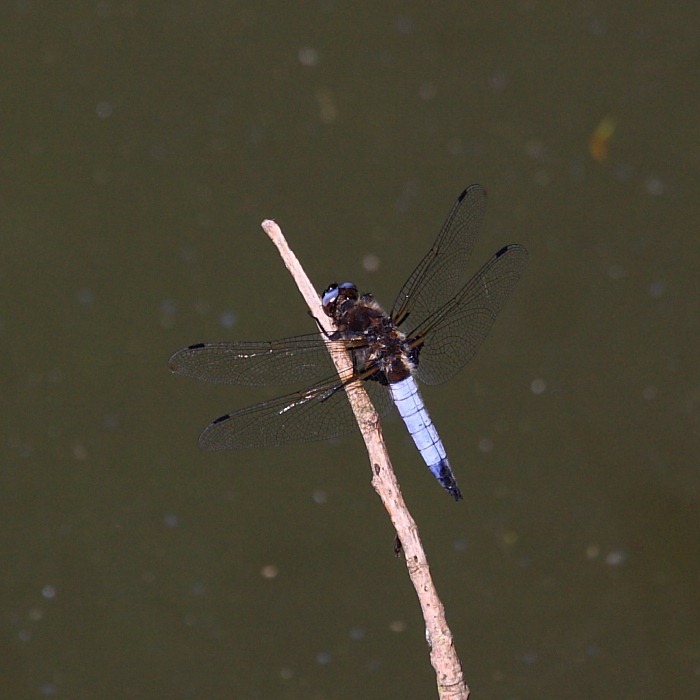 Given the blue pruinosity, it looked a bit like a Black-tailed Skimmer (Orthetrum cancellatum) without a) a black tail, and b) a right forewing. How on earth it got this beaten up this early in the season, I don’t know. We continued. Approaching la Sèvre, we crossed a bridge over a small canal where another Black-tailed-Skimmer looking critter was using a bare stick as a hunting perch. This critter actually had a black tail though rather less than I’d expect. I couldn’t approach close through the banks of stinging nettles but I snapped it anyway for the record. At least it was in good condition with a full compliment of wings. I may have notice things like a glaringly obvious missing wing but what I had failed to see was the tell-tale dark brown triangles at the base of the hind-wings in both these specimens. The brown triangle is diagnostic of Chasers (Libellulidae). Both three-winged and four-winged specimens were chasers. Mr. Three Wings has a broader body and no black segments on the abdomen. He’s a very much worse for wear Broad-bodied Chaser (Libellula depressa). [Ed: I’d be very depressed if I were in that state, too.] The pristine second specimen with the last two segments of its abdomen black is a Scarce Chaser (Libellula fulva) and and constitutes my third new species of the trip. I’d like to find a female which apparently has a rather fetching orange coloured abdomen.